The Pens welcome mystery writer Peggy Ehrhart today. Peggy writes mysteries about a blues-singer sleuth—and has been known to play a mean blues guitar herself. The second in the series, Got No Friend Anyhow, came out just a few weeks ago! Elvis Costello once observed that writing about music is like dancing about architecture. In other words. . . pointless. Every art form is its own thing, and if you want to experience music you should go listen to some. You won’t find it in a book. So I created a mystery series that took the reader into the grungy world of a struggling Manhattan blues band. 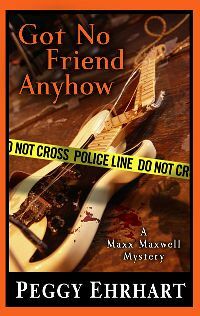 I used all my descriptive abilities to make the reader understand why my blues-singer sleuth, Elizabeth “Maxx” Maxwell, was willing to give up the comforts of a conventional life to pursue her dream of leading her own band. I also wanted the reader to understand Maxx’s inability to resist the allure of guitar players, an allure that arises in large part from the magical sounds they spin from their fingers. My own guitar-playing habit, which started because my son was taking lessons and they looked like fun, made me all the more determined to capture in words the sounds I struggled so hard to make my fingers produce. In defense of my efforts I’d like to try to refute Costello’s observation. Writing is a representational art, and thus it has to be about something. If it’s about a character taking a sea voyage, for example, the reader needs to voyage along with the character: to smell the salt air, feel the thud of the waves against the prow, hear the seagulls cawing overhead—not to mention see the ocean’s surface froth into little whitecaps and squint as the sun glints off the water. Similarly, if a scene takes place in a blues club, the reader needs to smell the sweat and cigarette smoke, feel and taste that draft of cold beer as it slides down the protagonist’s throat, see the featured guitar player strut across the stage with his gleaming Stratocaster guitar, and, above all, hear the funky jangle or the sweet growl of the notes he teases from his strings. There are lots of us out there—people who didn’t get Elvis Costello’s message or who refuse to believe it. In the July/August 2008 issue of CrimeSpree Magazine I published an article called “Musical Mystery Tour.” In it I discussed an exhaustive roster of mystery writers who set their stories in the world of popular music. (There’s a whole parallel universe of mystery writers whose victims meet their fate on opera stages or in orchestras.) And I’ve been on a number of panels at mystery conferences devoted to mysteries with music, most recently at Left Coast Crime in 2010. There, our panel was moderated by Bill Moody, who writes the Evan Horne mystery series. Evan Horne, a jazz pianist, solves fascinating crimes that take him into the lives of jazz icons from the past. And Bill himself is a jazz drummer. So I don’t believe that writing about music is like dancing about architecture—but, in fact, if the Alvin Ailey company announced a new production titled “Notre Dame Cathedral,” I’d reserve a seat in the front row. Peggy Ehrhart is a former English professor who writes mysteries and plays blues guitar. She has published in the field of medieval literature and has won awards for fiction. She writes the Maxx Maxwell mystery series, published by Five Star/Gale/Cengage and so far consisting of Sweet Man Is Gone (2008) and Got No Friend Anyhow (2011). Sweet Man Is Gone is now available in Kindle and a variety of other ebook formats. Visit Peggy at www.PeggyEhrhart.com. Welcome, Peggy! Lovely post. You're absolutely right, and Elvis Costello, much as he makes brilliant music, is not. Artists don't work in fields with electric fences between forms of expression. That's not how we live and write or dance or make music or sculpture or live. Thanks! Oh, yeah, I love this. I understand how hard it is to write about music (or dance) and have it come to life, but it sounds like you've got it down. Lovely. All art forms are an expression of another form. It's our job as artists to interpret in our medium of choice for our readers/listeners/observers/fans. Great post! Hello Peggy, and welcome to the Pensfatales! I love this post. As someone who was a painter long before beginning to write, I adore the overlap amongst the arts. Writing about painting is like painting about writing -- complex, demanding, and challenging. But to evoke the spirit, whether through words or paint strokes, is magical. Thank you, everyone, for your comments, and thank you to the Pens Fatales for inviting me to visit. Elvis Costello did say it, but was probably not the first. As one might guess, his context was in an interview in which he had been asked about reviewers' reactions to his work.